This morning on board the Cetacea, we headed out to the southwest corner of Stellwagen Bank. On our way out we saw a few scattered grey seals! We first spent time with two finbacks travelling in close vicinity of each other. 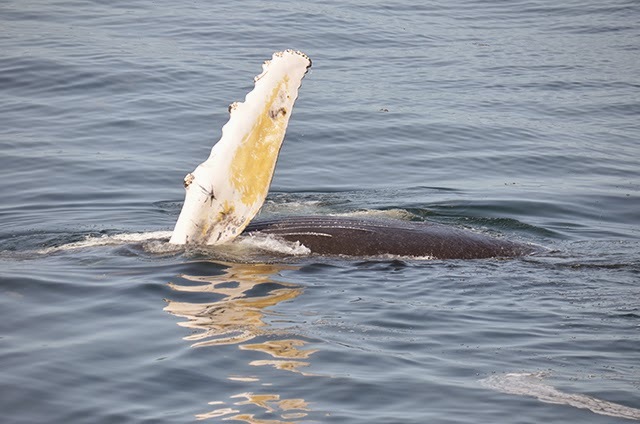 We got great looks at both sides of the finbacks, passengers could easily see the asymmetry of this species! After not too long, a single humpback appeared in the area. It turned out to be Rapier! There was a lot of fixed fishing gear in the water where these whales were traveling and it was a little unnerving to watch the whales maneuver around all the buoys and flags! After a little while, we moved on to where we saw a few more blows in the area. We spotted a mother-calf pair that turned out to be Milkweed and her 2014 calf. It was a beautiful day out on the water! This afternoon we headed out to the Southwest Corner once again, but we found whales a bit sooner than we expected! We happened upon Dyad early on in our trip! Dyad was consistently fluking and taking 3-4 minute dives. After a little while, we moved over to a mother-calf pair in the area. 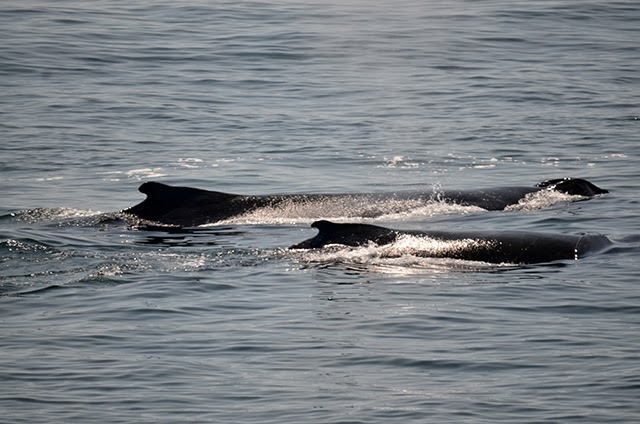 While we were headed their way BOTH mom and calf breached! It was an amazing sight to see both whales fully out of the water from afar! Luckily for us, the calf continued to be surface-active throughout the rest of the trip treating us to many breaches, rolls and flipper slaps! This pair turned out to be Reaper and calf and it was an awesome trip! This morning for the 10am we headed out to the southwest corner in beautiful flat conditions, the special days we get to mark catspaw on our data sheets! We found several whales, Rapier was doing some kick feeding and Reaper and calf where traveling for a while. We spent most of the trip with Reaper and her calf. 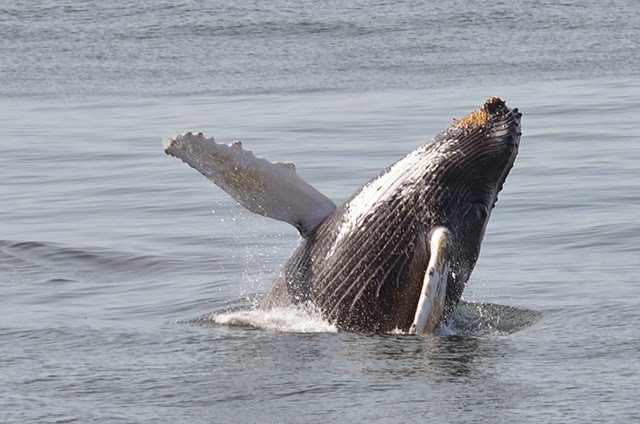 Both whales were taking longer dives, around 5 minutes, but we did get some fun rolling from the calf which showed off those huge pectoral fins. When this calf reaches full size he or she will be in possession of the largest appendages in the animal kingdom. 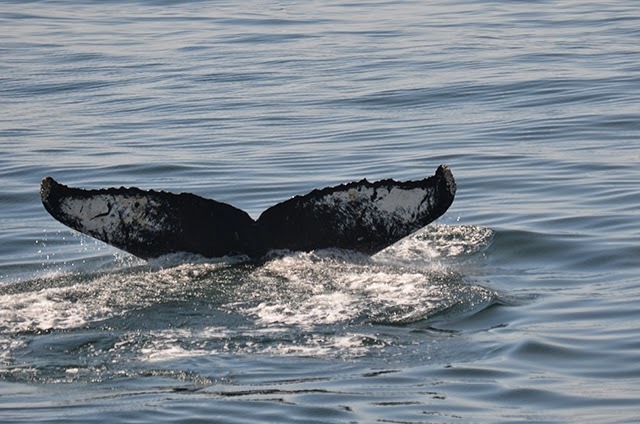 After a few near fluking dives, I finally managed to get a photograph of the underside of this calf’s tail, unlike its mother’s more mottled tail, this little whale will probably have a much lighter tail. It was a great day on the water with these whales! On the Aurora we were lucky to find Milkweed and her calf on the southwest side of Stellwagen Bank, close to Provincetown. Milkweed and her calf were being very cooperative and the calf started rolling right next to our boat and swishing its tail along the surface. Then the calf blew two small bubble clusters that I explained could be an imitation of Milkweed feeding. It is so important for calves to mimic behaviors of its mother so when the calf is alone next year, it will be able to eat on its own. There were a number of different bird species seen today and since we were right near Provincetown we were able to find a harbor seal! Passengers were able to get a great look at it as it came pretty close to our boat. It was a beautiful day out on the water today and we were able to get wonderful views of Milkweed and her calf! 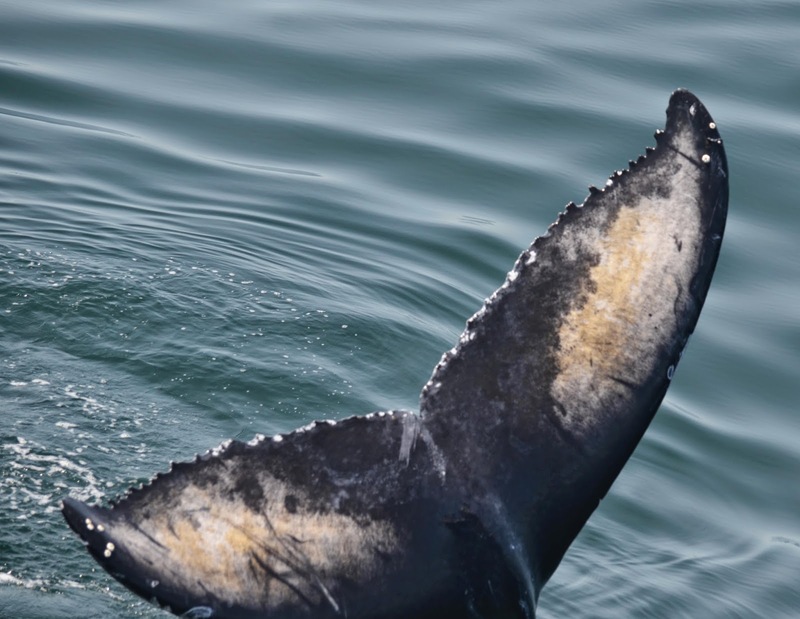 The New England Aquarium is partnering with Boston Harbor Cruises to give visitors front row seats to view the ocean's most fascinating and magnificent animals onboard the Asteria, Aurora and Cetacea. 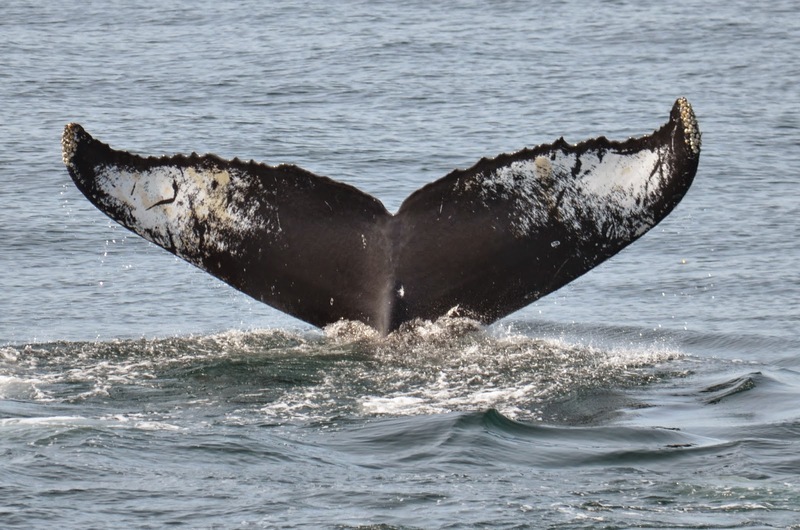 Naturalists share sightings and pictures here on the Whale Watch Log. New England Aquarium Whale Watches leave Central Wharf several times a day.